I’ll admit it – accessories for children are not something I’ve spent much time thinking about. Once I’ve wrangled them into tops, bottoms and shoes, I’m pretty worn out. But you know what? Accessories for kids are really, really fun and I’ve found some that have me properly excited. Come and see. 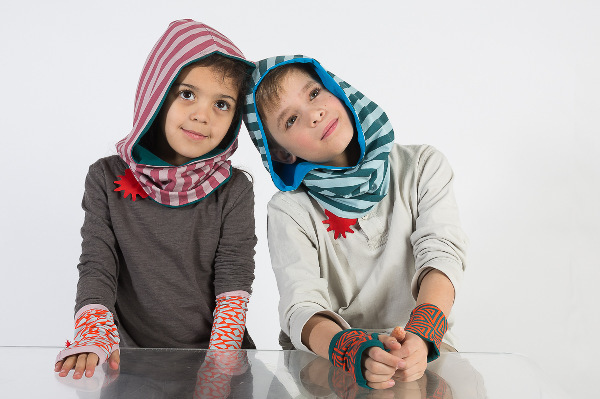 The brand is UK-based Red Urchin, and their speciality is organic, super soft cotton pieces for kids in lots of fun prints and bright colours. And although lots of labels do great organic clothing these days, Red Urchin stand out from the crowd with fun and useful kids’ accessories line. Topping the list are their Snooches, a kind of soft cotton neckwarmer. They’re great for a bit of extra warmth, and kids love them because they are loose and not clingy around the neck, like a scarf would be. The Snooches from Red Urchin are reversible, so you get two designs in one – and last year they were so popular after their initial release that they sold out three times! This year, Red Urchin is building on that success by offering Hoodie Snooches (pictured), which will be available from September. This is the kind of item that’s sure to be a hit with kids (like mine) who wish all their clothing could be hooded. Hand in hand (pun intended!) with the release of Hoodie Snooches are Red Urchin’s new Armies – organic cotton reversible armwarmers, which come in micro (wristband), mini and maxi lengths. They’ll be perfect for slightly cooler days for kids who want to stay in a basic tee but need a little extra warmth. We’ll keep you posted on their arrival. For now, you can check out the whole range at Red Urchin. Prices for Snooches begin at £12. Red Urchin will ship to Australia for £7.